Hello! I am back to share the last little part of our Christmas Home Tour. I am joining my friend Lindsay from White Buffalo Styling Co. along with some very talented ladies, who inspire me daily! If you are coming from With Heart, welcome! I have slowly been sharing our home with a couple of blog tours. 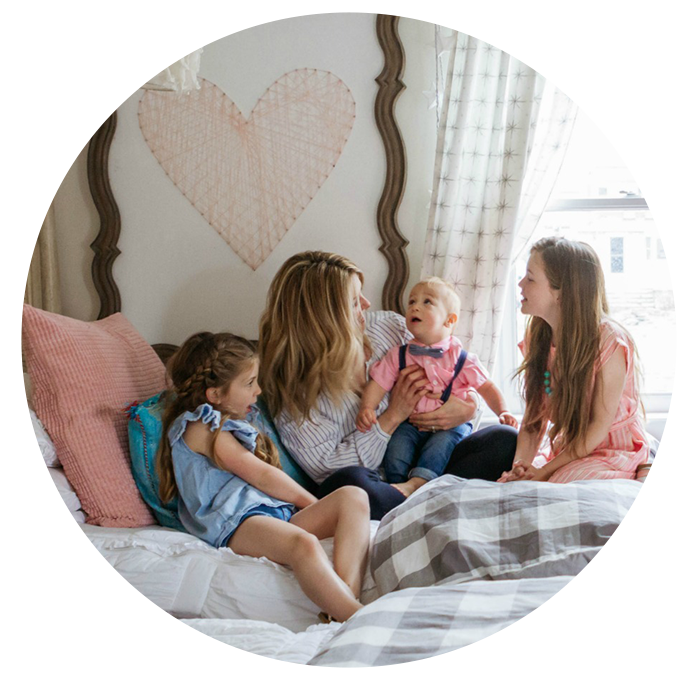 I love joining my blogging friends for home tours, it is such a great way to get so many great ideas and to actually feel like you are on a home tour- one of my favorite things to do is see inside others homes. Today I think I saved the best for last, our daughters shared bedroom. Ella is almost 9 and Lola just turned 6. It was maybe one of the best things we did when we moved to this house two years ago- to have them share a bedroom. We moved from Utah to Connecticut leaving behind family, friends and a great home where they had their own rooms. It was scary to be in a new place- with new sites and sounds. Having each other really made them connect and rely on each other for comfort. You can hear them reading, playing, singing, dancing in their room. Now that it has a few extra lights glowing they seem to spend a lot more time in here- if that is possible. They have an area on the other side of their bedroom for all their toys. I am working on changing it up right now- I will be sharing that area soon. I made a couple of simple changes to their bedroom for Christmas and the winter months. 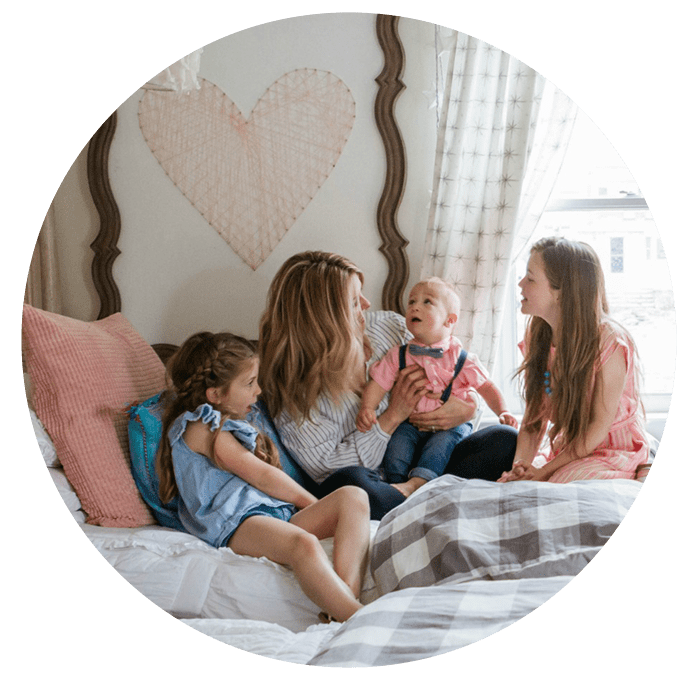 I switched up their bedding a few months ago to Beddys Bedding– we have loved how easy it is to make their beds. I added the gold dot blankets at the end of their bed for another layer and that little touch of gold. We have had that little light up house for a couple years now- love bringing out little sentimental touches. It was a gift from my mom. The little blue tinsel tree was a gift from my friend Denise. There a few things that I can’t part with so I pack it away to bring out year after year. I added the “Falalalala” art from VOL25 in our Delta Girl Frames. I like to switch up what is in those frames seasonally, that is why I didn’t do a piece of art in them. The felt garland and the initial ornaments add a little Christmas touch to their beds. I added a little tinsel tree I have had since Ella was born, it was am after Christmas sale that is just perfect in their room. I switched up the string art from a heart to a snowflake. You can read how I did it HERE. The sweet angels are new this month too. I don’t consider these Christmas- but they sure do look great with the little Christmas tree and little houses. You can find my art HERE from Deann Art, she is such a talent. 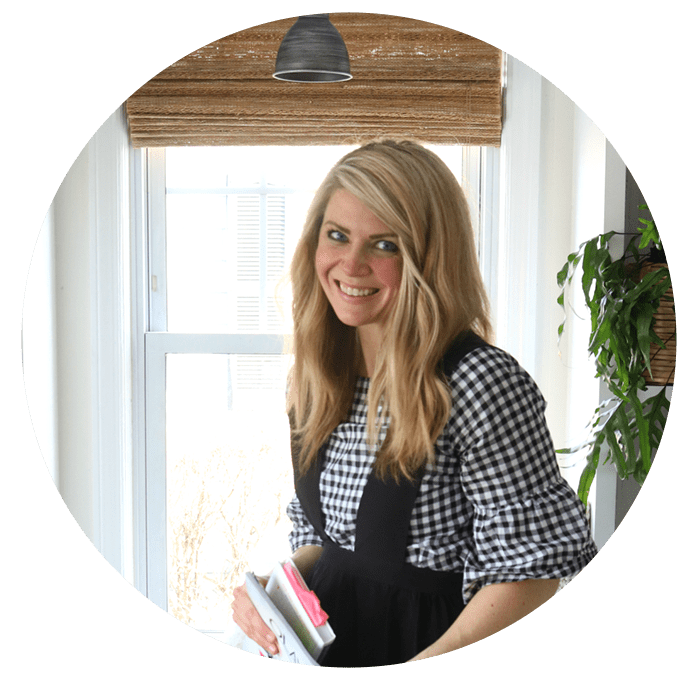 Follow along with the Blogger Stylin’ Home Tours by going to Life on Virginia Street next, she is sharing her home office and if it looks anything like her the rest of her Christmas tours you are in for a treat! Thank you for following along and reading my blog. We wish you a Merry Christmas and Happy Holidays- hope it is spent around the ones you hold dear. HGTV Full Magazine Spread- 1100 Square Feet Then and Now! Gees your kids room made my jaw drop to the floor. I love them so much. I had that fuzzy plaid pom pom pillow in my cart three times at HomeGoods and then put it back because they didn’t have too. I like to buy in pairs 😉 Love your entire home so much. Happy Holidays. Thank you Julia! I always think I need to buy two of everything too…even at the grocery store! Happy Holidays! Everything looks great! The pink dresser is epic! Thank you Kay! It is pretty fun! this is just the sweetest space ever! Thank you Kristin! I agree:) we have grown a lot in this little house! You are an inspiration…it’s all so beautiful! If you’re willing, could you please share where you found the cute gold polka dot blankets in your girls’ room? Thank you! Every detail is just pure perfection my dear. I just love your home!!! Beautiful as always!! Your home is so beautiful! What a talent you are blessed with! Can you tell me where you got the pretty red pom pom pillows? I am in love with them. Lovely home!! Could you tell me the approximate dimensions of the space taken up by the beds and the armoire unit in your daughters’ room? I live in an old farmhouse with tiny bedrooms. My girls are tired of bunkbeds (and so am I! ), and we’re trying to figure out a layout that wouldn’t be too tight to have to two singles in there. That whole are in your girls’ room looks so similar to ours, with a window approximately in the same location. Thanks for sharing! So inspiring!!! The length is about 12 feet from the beds headboard to the bookcase. Thanks for your kind words! I recommend tapping of the furniture in your room to get a sense of how it would be. Best of luck! Your home is so beautiful and charming! The antler chandelier is epic! Merry Christmas! Your home looks so warm and cozy! I especially love the garland around your headboard… very romantic! Merry Christmas! Thank you Julie! The lights do add so much cozy, don’t they! Merry Christmas!